When looking at a dog, or creating an illustrated standard project, are you seeing what you think you see? Visual tricks can overwhelm our eyes and mind. Verify what you see by these examples. -or can we always believe what we see and how does it apply to the illustrated breed standard? Color and markings can have an effect on how we perceive proportion in the dog. The heads above are the same. The brain and the eye communicate in complex ways, and can influence what is seen in the illustrated breed standard. What you think you see may not be the same as what you actually see. Following are some interesting and fun demonstrations that lead us to question and proof. Although your eyes may tell you that the rows in the horizontal and vertical images are zigging and zagging in different directions, the lines and squares in each image are actually in perfect horizontal or vertical alignment. Both images are the same. Flipping the images to either a horizontal or vertical orientation does not change the illusion. The illusion is the same and it is incorrect. Look closer, one line at a time, to verify this. The combination of the staggered squares creates a false impression. Can we trust our eyes in every circumstance? Does spacial relationship play a part in what we think we see? Look below. How many colors do you see in the image on the left? There are three colors, red, green, and white, although it may appear that there are variations. Colors placed in close proximity often create a shade which we visually perceive to be change, although it is not. The image on the right is the same, but converted to grayscale. Although the perception is not as pronounced, the grayscale image reinforces the effect of concentrated depth of shade in relationship to placement. The lines in the boxed image on the left below don't appear to be parallel, do they? You know by now that they are. Is it your brain playing tricks on your eyes, or your eyes playing tricks on your brain? 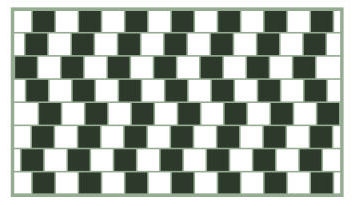 The diagonal lines are parallel to one another, as are the horizontal lines to each other, and the vertical lines to the other vertical lines. If we remove some of the lines, as in the same image to the right, does it make it easier to see? Are the horizontal lines below equal in length? Of course they are! We often see this misconception when looking at a moving dog. When a dog increases the length of stride and lowers the head, he may appear to be longer bodied than a similarly proportioned dog which lacks the ground covering movement. The dog with more reach and drive has a longer overall visual horizontal than the dog with less. If I moved them farther apart or rotated them by 90 degrees, would they look equal? They are the same, but now have different spatial relationships. By now, we know that we can never be too sure. In the clusters below, what certainly appears to be interior circles of differing sizes, actually proofs to show that both interior circles are the same. Keep these things in mind when estimating proportions. Proofing your foundation illustrated standard drawings assures that what you intend to convey is represented by a correct image. Visual Effects on the Body of the American Hairless Terrier. Both dogs are the same, but may appear different because of the shape and placement of markings, and the direction in which they face.